Cecil Field, an airport just outside of Jacksonville, Fla., was approved as the 8th commercial spaceport for horizontal launches in January 2010. 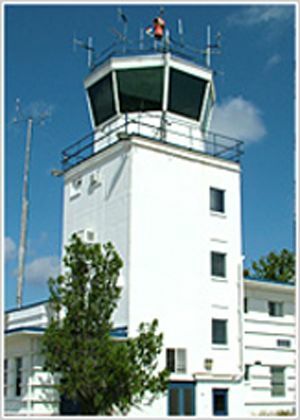 The airfield's traffic control tower is shown here. CAPE CANAVERAL ? The first wealthy touristsrocketing into space from Florida may start their trips in Jacksonville, notthe Space Coast. The Federal Aviation Authority last weekapproved Cecil Field, a former naval air station about 25 miles southwest ofthe city's downtown, as a spaceport for commercial launches of spacecraft like VirginGalactic's SpaceShipTwo. "We're extremely excited and very muchlooking to the future to work with potential operators," said Todd Lindnerof the Jacksonville Aviation Authority. State officials said Cecil Field wouldcomplement launch capabilities at Cape Canaveral Air Force Station and KennedySpace Center, not divert business from them as Brevard County looks to expandits launch portfolio in the post-shuttleera. "This capability - in addition tosimilar potential sites currently being researched at Kennedy Space Center andin southern Florida - is critical to providing our state with the competitiveedge it needs to be a key player in the U.S. space tourism industry,"Space Florida President Frank DiBello said in a statement. Cecil Field's license makes it the nation'sseventh commercialspaceport. It permits "horizontal" launches of vehicles thatwould take off and land like planes at the site's 12,500-foot runway. Rockets would ignite some 40,000 feet overthe Atlantic Ocean to begin suborbital flights for passengers paying about$200,000 each, offering several minutes of weightlessness and a view of theblackness of space. "Initially, the operations will be foryour upper-end leisure traveler, the person who wants an exciting ride,"Lindner said. Later, the market could expand tomicrogravity research flights and launches of small satellites into orbit frommotherships. Cecil Field's inaugural launch could come assoon as late 2011, Lindner said. But one industry analyst said findingcustomers could prove a bigger challenge for Cecil Field than winning the FAAlicense, which followed a lengthy environmental review and public input. "There are limited number of companiesdeveloping vehicles that Cecil Field can support," said Jeff Faust, asenior analyst with Futron Corp. and author of the "Personal Spaceflight"blog. "And they either already have arrangements with other spaceports orthey have their own issues in terms of their financial situation they have totake care of first before they can think about flying anyplace." Lindner said the aviation authority hastalked with companies including Calif.-based XCOR Aerospace and Oklahoma-basedRocketplane Global, but has no contracts in place. Financial problems have forced Rocketplane tostop development of its vehicle, Faust said. Virgin Galactic is buildingSpaceport America in New Mexico, so it would likely only look to Florida as asecondary launch site. Several other private companies hoping tolaunch people or cargo, including Armadillo Aerospace, Masten Space Systems andBlueOrigin, are developing vertical launch systems that would be potentialcustomers for the Cape, not Cecil Field. Space Florida is seeking FAA approval forvertical commercial launches from two Cape Canaveral complexes. The agency believes a network of spaceportswill serve the horizontal launch market, possibly at some point including KSC'sthree-mile shuttle landing strip. A feasibility study to use Dade-CollierTraining and Transition Airport near Miami is also under way. Publishedunder license from FLORIDA TODAY. Copyright ? 2010 FLORIDA TODAY. No portion ofthis material may be reproduced in any way without the written consent of FLORIDA TODAY.